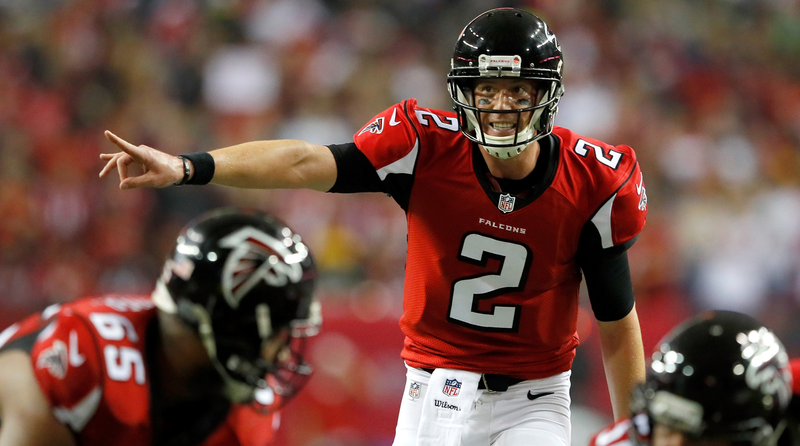 Falcons quarterback Matt Ryan wanted to watch the Super Bowl his team had squandered. He actually desired to relive the worst thing that’s ever happened to him—every misstep, every bad throw—and not just once but on three straight afternoons. Ryan now says he’s focused on the future, ready for another season, past the trauma, if not over it. But first he needed to look back in order to move forward. Ryan viewed the film alone at the Falcons’ headquarters in Flowery Branch, Ga. He settled into the quarterbacks’ meeting room, on the ground floor, with a view of the practice fields out the window. He did not pour a glass of whiskey. Nor did he draw the blinds. He sat down two days after the Super Bowl, turned on his laptop and took out his notepad as if it were any other game. Then he watched every offensive play, rewinding as necessary, scribbling detailed notes on concepts and sequences and mistakes. He did the same thing Wednesday, and the same thing Thursday. That’s how the Falcons approached this offseason, by dismissing the existence of any so-called Super Bowl hangover and recognizing the need to look back and then move on. It wasn’t that Atlanta needed to be reminded that it blew a 28-3 lead—the Patriots had 283 diamonds affixed to their championship rings, for God’s sake—but the Falcons needed to perform an autopsy of their collapse in order to understand what went wrong. In a word, everything. Thus Ryan suffered three times through the fourth quarter. He still fumbles midway through the final stanza, ahead 28-12 but not for long. His offensive coordinator, Kyle Shanahan, still calls for a pass on second-and-11 at the Patriots’ 23-yard-line with less than four minutes remaining, and Ryan is still sacked by defensive end Trey Flowers, every . . . single . . . time. 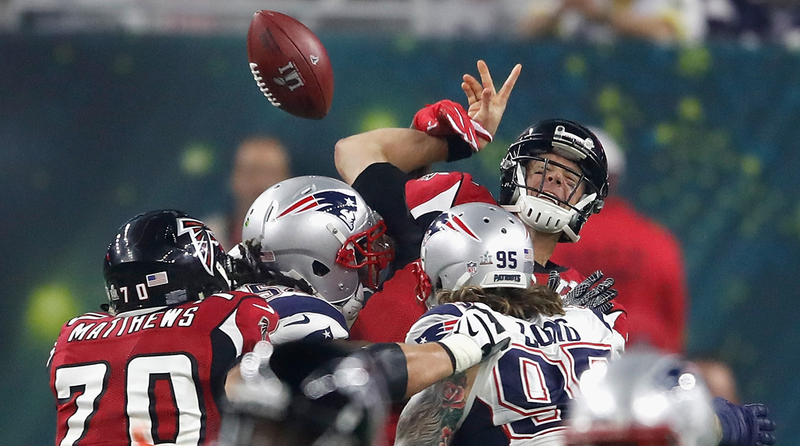 Tackle Jake Matthews is still called for holding on the Falcons’ next snap, and the Patriots still get the ball back, still score, still tie with a two-point conversion, and still win the first overtime game in Super Bowl history. As Ryan watched and watched— and watched—he tried to separate out emotion. He simply evaluated the plays called and how he executed them, same as any other week. In the weeks that followed those repeat viewings, Ryan relaxed with his wife, Sarah, and “let go of the toxic stuff.” He met with offensive skill players for workouts in Miami and studied under his private coach in Los Angeles to hone his throwing mechanics. He also welcomed a new coordinator, Steve Sarkisian, and a new position coach, Bush Hamdan. Then he made a Gatorade commercial out of the Super Bowl defeat. Part of a larger campaign, the slogan—Make defeat your fuel—bordered on cheesy but still encapsulated Ryan’s outlook for 2017. He wants to do what Russell Wilson and Cam Newton could not accomplish in recent seasons: return to the Super Bowl after losing it the year before. That and improve on his MVP numbers: 4,944 passing yards and 38 touchdown passes, along with a classic performance against the Packers in the NFC title game (392 passing yards, five scores). For years, Ryan was an elite NFL quarterback who for many reasons—Atlanta’s mediocre records, his laid-back personality, bad luck—still often lacked the recognition commensurate with his skillset and the numbers he compiled. In 2016, he dramatically changed that narrative with an MVP season and the Super Bowl appearance. But just when he appeared poised to cement his legendary status—and perhaps lock in a Hall of Fame career—the Patriots did Patriots things and ruined his coronation. All of which puts Ryan in an interesting position heading into this season: by award title, he’s the best reigning player in the league . . . and yet he’s again faced with an amount of doubts that are at least harsh, if not unfair. To understand how that happened, he must again look back in order to move forward. He must gaze all the way back to 2008. 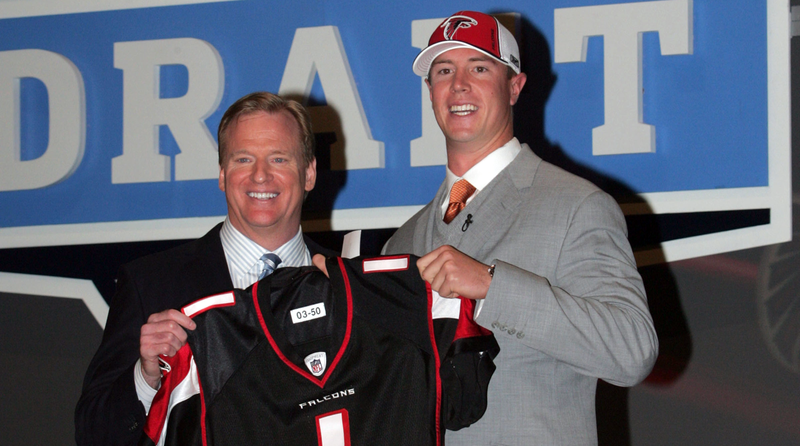 Roger Goodell and Matt Ryan at the 2008 NFL draft. What a year ’08 was for Matt Ryan and the Falcons. The team’s star quarterback, Michael Vick, had landed in federal prison in Leavenworth, Kan., after financing a dogfighting ring. As the NFL draft approached that April, he held out his admittedly long-shot hopes that he would serve his time and return to the Georgia Dome, clad in his familiar No. 7 jersey. The Falcons representatives who came to visit him did not dissuade that notion, Vick says. In fact, Atlanta’s evaluation process kept pointing back to the same lofty, almost impossible comparison for Ryan: Tom Brady. They didn’t want to oversell, or expect too much, and yet . . . when the Falcons finished their private workout on BC’s campus, new general manager Thomas Dimitroff boarded Blank’s jet and dialed up the workout video. En route to San Francisco, he swapped glances between the picturesque sunset out the window and his laptop screen, where the No. 12 he was evaluating resembled the No. 12 who at the time already had three Super Bowl rings. He knew which view was better. Ryan didn’t just look like Brady; he played like him. What Dimitroff didn’t know is that Ryan’s statistical leap during his senior season was directly linked to Brady, too. That’s when Steve Logan became the offensive coordinator at Boston College, after stints with two teams in NFL Europe. He had Brady’s backup, Rohan Davey, in Berlin in 2004, and he attended Patriots practices at the request of Bill Belichick, who taught Logan some of New England’s option routes, so he could hone them with Davey overseas. Ryan runs the Falcons’ offense in last season’s NFC Chamionship Game. Those, like Vick, who saw Ryan as “always on the cusp,” basically described him as the quarterback equivalent of food that tasted better than it looked. Good but not great. Great but not good. Elite, even, but not Brady, not Aaron Rodgers. Ryan had another problem before 2016, despite the gaudy numbers. Perception. When ESPN ranked NFL quarterbacks that summer, based on interviews with general managers, coaches and personnel types, Ryan came in an astonishing 13th. According to Nielsen, which measures the endorsement potential of celebrities, Ryan managed a 32 on their Awareness Scale, only slightly higher than the NFL average (30) and comparable to actresses like Sienna Miller and Evan Rachel Wood. His Likeability score was right at the NFL average of 58. To reach top-shelf recognition, Ryan didn’t increase his social media presence or hire a new publicist. He went back to work. He sought reform in California, with the mechanics guru Adam Dedeaux, whose company, 3DQB, specializes in quarterback-specific training. Dedeaux has worked with QBs of all sizes and skillsets, from Drew Brees to Tim Tebow to—here’s that comparison again—the football wizard known as Tom Brady. Shortly after the season ended, Ryan went to Southern California, where Dedeaux ran him through a three-day evaluation. They measured Ryan’s conditioning, biomechanics, nutrition, stamina, endurance, strength and throwing motion. Then they gave him a list of exercises, mostly to add functional strength to his throwing arm. This wasn’t to boost muscle mass, or increase bicep size, but rather to fortify the smaller muscles and joint tissue for what Dedeaux describes as more balanced strength. He told Ryan to return in six weeks, for a second evaluation, and when Ryan came back, Dedeaux noted immediate improvement. Their work continued throughout the offseason. Ryan boosted his core strength and slightly altered his motion so that he relied less on his arm. He generated more power that way, using his torso, creating a kinetic chain, and the revamped motion put less stress on his most valuable limb. Learning to throw hard easy, is how the QB guru describes it. Boy, was he. In 2016, the quarterback known for bland tastes, like how he favors cheese pizza and vanilla milkshakes, downright dazzled on the field. Dedeaux traveled to Atlanta regularly for troubleshooting Ryan set an NFL record by connecting with 13 different targets for touchdowns, led the league in quarterback rating (117.1, fifth-best in NFL history) and almost doubled his touchdown pass output from the year before. Dan Quinn, the Falcons’ coach, also asked Ryan to take a more active leadership role throughout last season. Dimitroff saw Ryan implement Quinn’s wishes, becoming more vocal, more available, an entirely different player from the skinny kid who had arrived in Vick’s shadow in 2008. Ryan spent more time with the Falcons’ defense and more time with teammates off the field, at restaurants, or for charity events. The Falcons’ offense soared. Ryan won MVP and catapulted into another stratosphere, the one occupied by top-shelf NFL quarterbacks, the rare air he had deserved but not attained until his ninth season. “That’s a reflection of Matt being more comfortable in a variety of ways,” Blank says, citing Ryan’s second year under Shanahan, better offensive line play, an improved run game and Julio Jones being Julio Jones as major factors. After Atlanta clinched its Super Bowl berth, Dimitroff found Ryan on the field and locked eyes. “This is your league now,” Dimitroff told him. Ryan is sacked and stripped of the ball in Super Bowl 51. McKay knows Ryan better than most. In college, Ryan used to return to his dorm room and throw up after every game. He wasn’t boring, wasn’t robotic, wasn’t the way he has so often described. He cared that much. He just believed in his routines. He believed that predictable action would lead to predictably great results. The question now, as we’re on the cusp of 2017, is how Ryan will follow the season in which he became both an MVP and an epic loser, the best player in the league and someone who suffered perhaps the worst loss in the history of pro football. Will he let the window close? Has he peaked? Or will Ryan get back to the Super Bowl and win it? Was 2016 a prelude to the year folks in Atlanta will tell their grandchildren about, for all the right reasons? — With reporting by Ben Baskin and Jonathan Jones.